Ircam Lab Releases "The Snail"
Ircam Lab has announced the release of their new tuner/analyser software, The Snail. Hornet Plugins has updated its explicitly-named VUMeter plug-in. 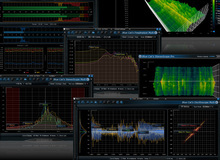 Nugen Audio has updated its analysis suite Visualizer 2 with new functions and enhancements.